Visual Studio Code>Other>react-explorer-addonsNew to Visual Studio Code? Get it now. Adds context menu items for creating the directory structures for React Components. 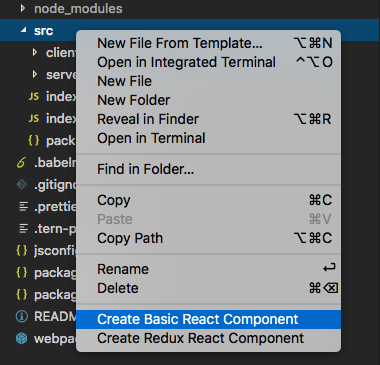 This extension adds context menu items for creating the directory structures and file templates for React Stateless and Redux connected Components. The extension will themn prompt you for the Component Name and will be injected into the React template. Not everyone uses the same React template format, so i realize the format used here is not entirely ideal for everyone. To resolve that I would like to add the ability to create your own templates in the future.